There are at least 80 species of Labeo or mudfish’s. They are specialised feeders of algae and have large inferior mouths with developed complex lips with grinding teeth in the pharynx and very long, coiled intestine. The “Labeo umbratus” group consists of four species. They all tolerate low oxygen levels and have small scales except the seebri .They do well in dams. They also have two pairs of barbells. They turn a very dark almost black when spawning. Eggs hatch after 3-4 days and they grow rapidly .They mature between 220 and 240 mm. They breed in large groups over very shallow waters and absolutely exposed to predators such as fish eagles, otters, and man. Although these fish are quit prolific in numbers riparian owners do not pay them the respect they deserve during the spawn periods. Females produce over 250000 eggs. The umbratus can be found in the Orange Vaal all the way down to the cape and major rivers. 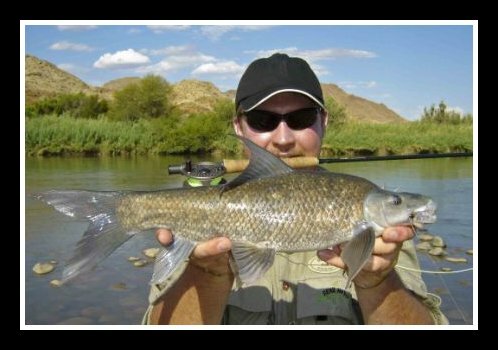 The Capensis or Orange river mudfish is the major fish species in the Vaal Orange river system and luckily difficult to target by anglers. Very little anglers, whether fly or conventional target them although there are anglers that specialise in these on conventional tackle. 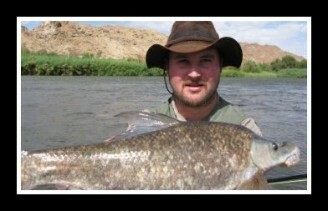 Most fly fishermen accidentally hook into them and then discover the brute power of this species. As far as I’m concerned the most powerful pound for pound in African waters, especially in the stream or fast flowing waters. It is absolutely amazing to watch these species lying still in fast flowing water. A mudfish foul hooked that turn sideways feels like a trout 4 -5 times its size. And it has sustained power. Due to its specialised mouth and eating habits they are mostly foul hooked by anglers targeting smallmouth yellowfish. Sometimes they take a very large streamer I think due to aggression during the spawn . I have once caught a mudfish on a 10 cm artificial bass lure hooked in the mouth as well. Small bloodworms are sometimes taken if retrieved on the bottom between the rocks where they feed. Fly dropped to between rocks where they feed, slowly drifting or stationery. It is possible to sight fish for them. 5/6 weight tackle with float/ intermediate 2kg tippet. Conventional record in the region of 4 kilos. 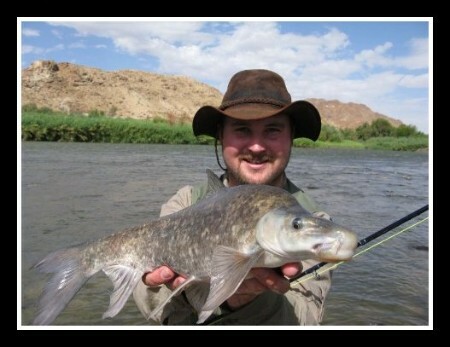 The Orange River definitely have specimens of over far over 5 kilograms, and they are caught on fly.